A new study into the gambling habits of Australians has found almost half of us (49.1 per cent) gambled in the 12 month period to March 2018, slightly down from 50.6 per cent the year previous. 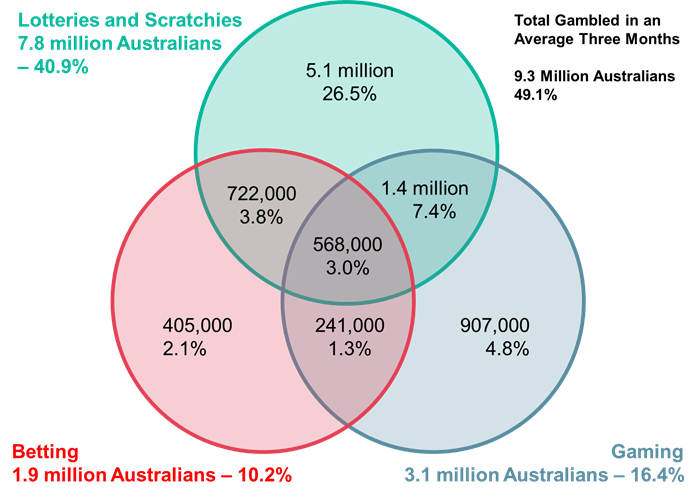 The study by Roy Morgan Research included 50,000 respondents across all forms of gambling and found that scratch lottery tickets were Australia’s number one choice for a punt. Commenting on the findings, Roy Morgan CEO Michele Levine said: “Gambling is now an activity which nearly half of all Australians participate in within a three-month period, but this statistic alone does not do justice to the varying behaviours of those millions of gamblers. They vary from casual scratchie buyers to work friends betting on their footy team to wealthy businessmen at poker tables. “Analysis of deep consumer data is needed to get a clear picture of Australia’s gamblers, and that picture looks to challenge some of the current understandings of the industry. Gambling in special contexts, such as casino or online betting, need to be examined as part of a broader context, the type of context that only Roy Morgan’s Single Source, with its deep view of the Australian gambler, can provide. “For instance, looking at the upward trend in online sports betting, this powerful growth is driven by mobile phone betting replacing traditional bookies for convenience, accessibility and breadth. Punters are now able to gamble on the AFL, NFL, Premier League, NBA, and more all at the same time, place, and at the best odds available to them. “Of the 3.4 million people who place at least one bet each year, 34.1 per cent of them bet online, which is notably higher than other online gambling categories, such as online poker (6.2 per cent) and online casino games (13.2 per cent),” Levine said.